When I first receive the parcel with LANEIGE's new Two-Tone Lip Bar and Eyeshadow Bars, I was elated. 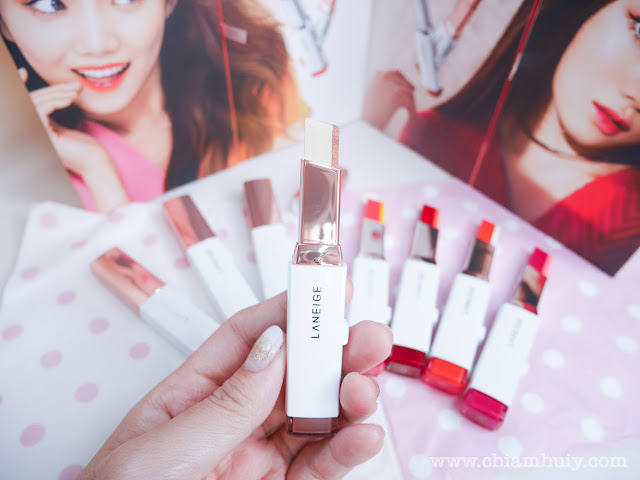 The original Two-Tone Lip Bar had received so much love from Korean makeup fans and those who love fuss-free cosmetics, LANEIGE decided to bring in more colours and this time round, with a whole new cosmetic item - Two-Tone Shadow Bar! I guess the new Two-Tone Shadow Bar was one of the more exciting news that thrilled many beauty enthusiasts like myself. The silly at first didn't realise the four out of the 8 Two-tone bars are actually for the eyes! That explains how excited I was until I didn't had the time to read the press kit properly before started playing with these new LANEIGE cosmetics hahah. With the new Two-Tone Shadow Bar, it makes applying eyeshadow as easy as how you could achieve a Korean gradient lips by using the Two-Tone Lip Bar. 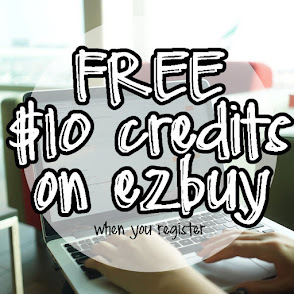 The texture is soft and creamy, which makes blending easier. That also depends if you like such cream eyeshadow, cos as for myself I find it more longer lasting. I love the shimmery elements in all the Two-Tone Shadow Bar which brighten up my eyes. LANEIGE Two-Tone Shadow Bar comes in four colors: (from left) Humming Coral, Golden Rose, Orange Island, and Coffee Bronze. 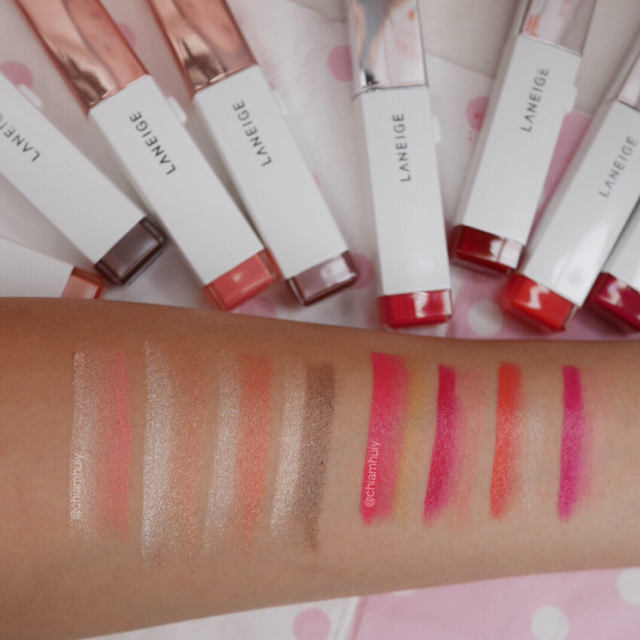 On the other hand, the LANEIGE Two-Tone Lip Bar new colors are: (from left) Juicy Pop, Maxi Red, Orange Blurring, and Dear Pink. Just like the original Two-Tone Lip Bar, these new colours are equally moisturising and easy to apply. 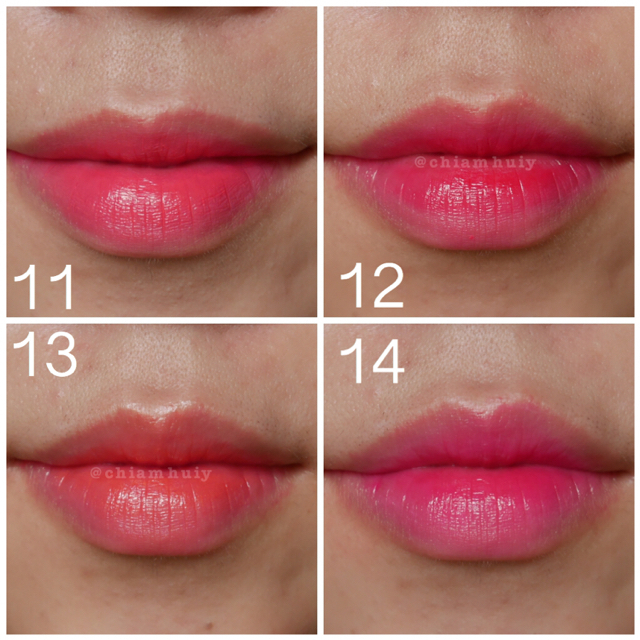 I always love the gradient look that I can easily achieve just be a few swipes across my lips. The main matte colour (to be applied to the inner side of the lips) features an upgraded pure pigment technology – which marries Aqua Color and Glass Polymer – for a brighter and more vivid colour payoff. The outer colour on the other hand gives a soft, subtle tint on the outer side of the lips.